The other day, we were having friends over for dinner and I was looking for an easy-to-make-not-too-heavy dessert to make. Chocolate was out (I had made Petits Pots de Crème not too long before)... and I wanted something with fruits. All right, serving fresh raspberries in late Fall in Philadelphia is not really eating local... but I was lucky enough to find Chilean raspberries (Chilean??? That's REALLY not local!!) on sale at the supermarket; it made me feel somehow better. You see, I have this special relationship with Chilean raspberries (and not just because they were on sale). My husband and I were supposed to go to Argentina for our honeymoon in December 2001 but had to change our plans at the last minute because of the 2001 crisis that shook the whole country just three days before we were supposed to leave. Since we already had tickets all the way to Buenos Aires, we decided to add another leg to our already-long journey and go to Chile instead. I don't regret it! I don't think that I would have planned a trip to Chile, had we gone to Argentina first. And that would have been a shame! I fell in love with Chile. I won't go into details in this post because it would take me too long. I will just explain the raspberries (and tell you to consider Chile as one country to visit at least once in a lifetime.) At some point during our trip, we ended up in the small town of Osorno. Without knowing why, cafes and restaurants were serving delicious fresh raspberry juices, and other raspberry-based desserts. One day, on our way to a hiking camp (yep, we are the hiking types), we drove through fields and fields of raspberry bushes. Superbly aligned, extremely well maintained raspberry bushes. Needless to say that I had never seen so many raspberry bushes in my life before... That explained the raspberry juices and desserts. That explains my special relationship with Chilean raspberries in the middle of the Northern Hemisphere winter. They are not local but I know where they (most likely) come from! 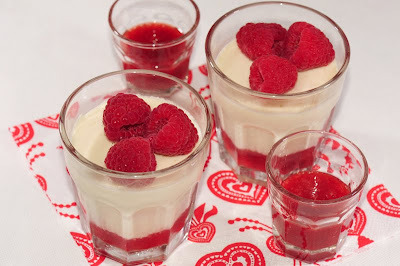 With the fresh raspberries in, I decided to make Panna Cottas. I had them once before and I remembered liking them : it's lighter than a mascarpone-base dessert and can be declined with different milks (cow, goat, coconut, almond, rice, etc.) and flavors. This recipe for Panna Cotta (inspired by Tartelette) is simple and will be a success if you let them cool in the freezer for a few hours before serving them. You could also make them the day before; in a way, it's a dessert made to please everyone. My kids loved them and are already asking for more of the "tu sais, le dessert blanc dans les petits verres avec des framboises (oh you know, the white dessert in the small glasses with raspberries)". I guess, I'll have to wait until the Chilean raspberries go back on sale. In the meantime, enjoy! Bon Appétit! In a blender or using a hand vegetable mill, puree the then-frozen-now-thawed raspberries. Add the Agave syrup to sweeten it. Add more if you like your coulis very sweet. Divide the coulis in 8 different glasses/ramequins and freeze for about one hour. Put the water in a small bowl and sprinkle the gelatin. Let it solidify and reserve. Over medium heat, in a large pot, bring the half-and-half, vanilla ,and sugar to a simmer. Remove from the heat and stir in the gelatin until it is fully dissolved. Divide into the 8 glasses/ramequins. Put in the fridge for another 3-4 hours before serving. Serve with fresh raspberries and additional coulis (if any). If you want to gain time, you could skip pouring coulis at the bottom of the ramequins/glasses and only serve coulis on the side. Especially if you are serving the Panna Cottas in ramequins and we can't see the coulis at the bottom. Freezing the coulis in the ramequins will prevent it from being mixed when you pour the warm cream. You could use agar-agar or Kosher gelatin if you are vegetarian. You could use any kind of "milk" and cream as long as there is some fat in them (like a full fat non-dairy creamer or a non-dairy half-and-half). Helen from Tartelette has interesting Panna Cotta recipes if you are looking for more complex creations.